Father Ronald, pastor at St. Louis parish in Novion and St. Francis in Bayeux, Haiti recently celebrated his 10 year ordination. At the sametime, St. Francis celebrated 10 years since it's founding. A concert was held in Novion and a 10 year anniversary celebration in Bayeaux. The students dressed in white with red bows on their clothes are youth preparing for their confirmation. Those dressed in gray with yellow collars represent the choir in Bayeux. Construction of a new six room school house has begun in Novion and is due to be complete by September 2018. Funds for the project were obtained through Caritas International. Presently, classes are held in church and a primitive two-room school. To help celebrate the 10 year anniversary of the founding of St. Louis Parish in Novion, a new roof was placed on the church and rectory. In addition, new construction has begun on a sacristy, parish office and small adoration chapel. The Novion Education Sponsorship Team sponsors the education of 142 students in Novion and Bayeaux, Haiti for the 2017-18 school year. Enrollment in the two schools is approximately 250 students. The $250 sponsorship fee covers the cost of a child's education including tuition, books and uniforms for one year. 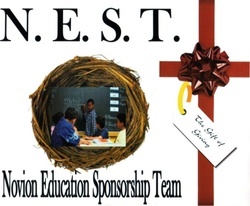 **Click here to read an Informational Sheet about NEST. The Haitian Carnival is a national, cultural celebration held over several weeks in March each year leading up to Mardi Gras. In Novion and Bayeax the schools organize a carnival for the students in their schools. A king and queen is chosen. Each kid chooses the profession that he wants to do when he gets older, such as a nurse, doctor, priest, president, lawyer, policeman, teacher, agronomist or nun. Then their parents make them a costume according to the kids' desire for the future. A parade is held and food is served to celebrate "Canaval". On December 21, Novion held their annual Christmas party while Bayeux held their party on December 22. The party is held from 9:00 am to 1:00pm. Students gather together to share Christmas and New Year wishes. Students participate in a talent show sharing their gifts of singing, dancing, and reciting poems. Following the talent show, students enjoy a Christmas meal consisting of traditional Haitian food: goat, rice, plantain, and fruit.